A buoy run aground illustrates the decreasing water level at Huntington Lake reservoir in Fresno County, part of SCE’s Big Creek hydroelectric system. Boat docks illustrate the decreasing water level at Huntington Lake reservoir in Fresno County, part of SCE’s Big Creek hydroelectric system. 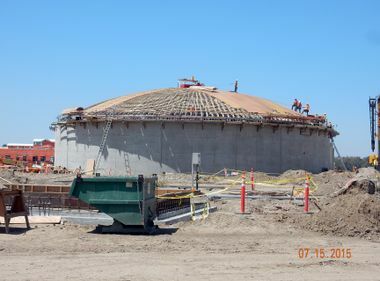 SCE’s Mountainview power plant in Redlands includes a pond for capturing rain water for reuse in the cooling process. SCE uses reclaimed water and other measures to aid in the efforts. Though he and his counterparts at water agencies statewide have been battling drought conditions for years, the proposed restrictions are unprecedented and will greatly increase the need to conserve water. “All the different water companies are comparing notes about what we need to do,” Arrighi said. Southern California Edison’s Rosemead headquarters sits in the San Gabriel Valley Water Company’s service territory. Landscaping surrounding nearly all SCE buildings in Rosemead has been irrigated with reclaimed water since 2010. The move has helped save an average of 2.9 million gallons of drinking water each month. Edison’s move was “very helpful for lowering per capita use of potable water” for his agency, said Arrighi. SCE uses other methods to reduce water usage at its facilities across its 50,000-square-mile territory. 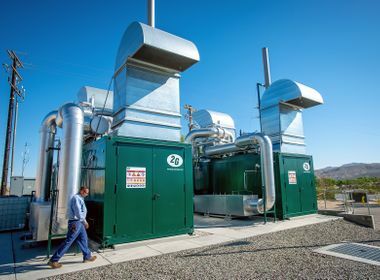 Its Mountainview power plant in San Bernardino County uses only non-potable water for cooling operations, as permitted by the California Energy Commission. The remaining 50 percent used by Mountainview is reclaimed water from the city of Redlands, where the plant is located. The plant also captures storm water for use in the cooling towers. In addition, the Mountainview plant recovers and recycles 80 percent of the water discharged from the plant’s cooling processes. At a 62,000-square-foot SCE facility in Alhambra, the company installed drought-tolerant landscaping, a “climate-smart” irrigation system, low-flow fixtures and rainwater harvesting and reuse. Those features reduced indoor water usage by 53 percent and landscape water usage by 67 percent. The facility was completed in 2012 and attained the Leadership in Energy and Environmental Design (LEED) Gold certification from the U.S. Green Building Council, in part for its water-efficiency features. Since 2012, new SCE construction projects have been built with LEED certification as a goal. 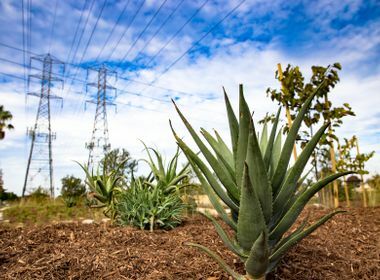 SCE has also installed sustainable, drought-tolerant landscaping at more than 20 facilities across its service territory, with water use reduction averaging 60 percent at those locations. Arrighi said he believes the upcoming restrictions will drive more water-efficiency measures, even among early adopter companies like SCE.